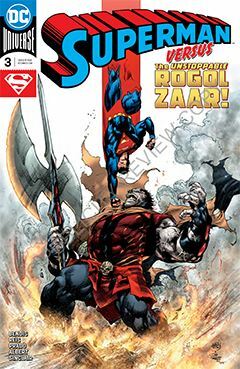 Superman thought Rogol Zaar was safely tucked away in the Phantom Zone. Well, he was half-right. That’s where he is alright, it’s the “safe” part that’s in question. Cuz some knuckleheads at STAR Labs have managed to transport the entire planet into the Phantom Zone, and Rogol Zaar is all too eager to dish out a little payback, enlisting some of the other inmates of PZ for help. Meanwhile, those on Earth are beginning to suffer the ill effects of life in the Zone. Other heroes begin to fall, cut off from the Speed Force or the central GL battery on Mogo. And some of the “normal” heroes, such as Batman, Nightwing and Green Arrow are all too human and vulnerable. Reis and Prado’s artwork is extraordinary, as I’ve come to expect. IT’s simple during the quieter moments, while heavily textured during more dynamic sequences. And I appreciate Bendis’ call backs to other pieces fr4om Superman lore, such as Jax-Ur and LiveWire. I’m glad somebody appreciates the richer history of the DCU. I’m still trying to reconcile Superman with Action Comics. Both are written by Bendis, but there seems to be two individual storylines taking place. Perhaps I’ve missed allusions to one or the other, or maybe it will all make sense later on. I’m willing to be patient – for now.